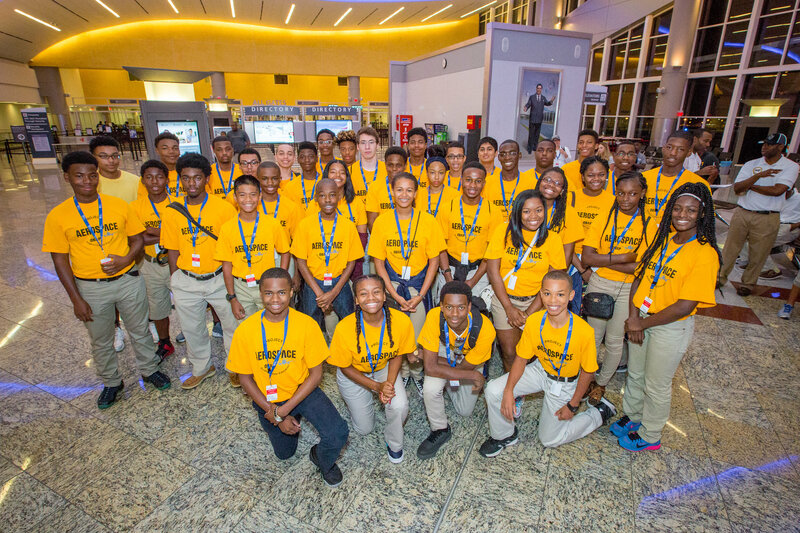 Delta and the Organization of Black Aerospace Professionals recently hosted around 150 students, ages 14-18, on the airline's 17th annual Dream Flight for a day-long field trip to a major aviation facility. The flight, which flew students from Atlanta to the Naval Air Station in Pensacola, Fla., is part of the Aviation Career Education Academy and Flight Line summer program, also co-sponsored by Delta and OBAP, for teenagers who have an interest in pursuing careers in aviation. Once students arrived at the base, they watched a flight demonstration from the United States Navy Blue Angels and toured the Navy Flight Academy, Navy Water Survival Facility, National Navy Aviation Museum and the Naval Flight Officer Training Wing. Students also had a chance to interact with members of the U.S. Navy and learn about the various careers available. "It's not about what we get out of it; it's what we're giving back," said Delta Captain Calvin Allen, one of the Dream Flight pilots. Allen has worked with OBAP's Aviation Career Education camp since 1982 and is director of an ACE Academy located in San Antonio. "Through ACE, we have the opportunity to expose these kids to something they've never experienced before and help them explore the world of aviation." ACE and Flight Line also encourages the students to be more involved in math and science, Allen said. Delta First Officer and Dream Flight Pilot Stephanie Johnson echoed those sentiments, explaining that the program helps students discover their aviation aspirations by providing them with real-life experience. "Delta's partnership with OBAP is important to introducing student to aviation, particularly in the African American community. The best way to know if you want to pursue a career is by seeing someone else do it, so that's exactly what we're trying to do," she said. ACE and Flight Line provide students with a behind-the-scenes opportunity to experience the operations in the aviation field. The focus of the program is to teach students aviation history, aerodynamics, meteorology, navigation and flight simulator orientation with qualified flight instructors. Select graduates from ACE Academy are invited back the following year to participate in Flight Line, an in-depth program that focuses specifically on pilot training, including allowing students to perform solo flights during their two-week-long training. First Officer Drew Fellers, one of the Dream Flight pilots, offered some advice to the students: "Stay determined and persistent." Although this is Fellers' first year on as a Dream Flight pilot, he's no stranger to Delta or the ACE Academy program. Fellers started on the ramp 20 years ago and became a Delta pilot in 2007. Fellers, and his fellow pilot Captain Patrick Alexander, both went through ACE programs, under the direction of Capt. Alexander's father and ACE Academy leader, Julius Alexander. Previously, the two pilots were also ACE program volunteers. Alexander's sister and Delta Flight Attendant, Julie Alexander, attended the flight as well. Although many ACE and Flight Line students aspire to become pilots, the programs also show students the wide range of careers involved in the aviation field. Throughout the week, Delta volunteers from across the airline lead students on tours around Delta TechOps, the In-Flight Training Facility and the OCC where students learn about aircraft maintenance, flight attendant training and airline operations. "My son has always loved aviation, so the camp was a perfect fit," said Robin Saul, an ACE Academy parent volunteer. "But the program really shows how the aviation field has something for everyone, from physics and engineering to finance and communications."